I’m two weeks past my November internet fast and… I kind of miss it. It was very peaceful. It’s easy to say that you’re not going to waste time on unnecessary media browsing; and it’s even possible to stick to that goal. But there’s something about being literally unable to cheat on your plan. In a weird way, the pressure is off. You don’t have to exert willpower to stay away, because there just is no access available. And willpower is not an infinite resource, as so many self-help books will tell you nowadays. You don’t want to spend it all on trivialities and have it depleted when you really need it! So, I might repeat the regimen in January. I’ll still have (as I had last month) the really necessary access available via my phone — email, mainly, in case something comes in that needs immediate urgent response. I’ll just have to make sure that any research I need done for the work I have planned in January is located, accessed, printed and/or acquired, and if possible read and integrated ahead of time, before pulling the plug. Or, declining to connect the plug, in my case. I don’t have wired-in internet, and just buy a month’s access at a time through a nearby hotspot. And should I really need access, and can’t wait until the end of the day — well, home is exactly two miles from my office, and the library just over one mile away. 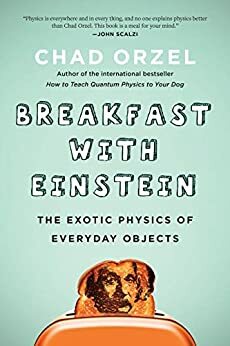 Physicist Chad Orzel’s latest science book is out: Breakfast with Einstein. It showed up on my Kindle a couple of days ago, because I wisely pre-ordered it. I haven’t had a chance to dig in to it yet, but Professor Orzel is a favorite of mine, and always illuminating, so I feel secure in recommending it. Apparently John Scalzi, who has read it, agrees with me. He’s blurbed the book . Right there on the cover. And featured it with a guest-post by Chad himself, which you can read right now on Scalzi’s Whatever blog. Another thing about our Mr. Scalzi: every December he generously allows writers, artists and other creators to talk about their own work in his Holiday Gift Guide series — and he has a very big readership. This year I tried to be right on the spot to see if I could grab a position as near as possible to the beginning of the listing. It’s first-come, first-serve, but I didn’t know what time the blog would open up for submissions. And my sleeplessness paid off: I nabbed third place. So… should you need an idea for a holiday gift, well, the books are out there. And in paperback ,now, too! I would be remiss not to remind you of this. For formality’s sake. 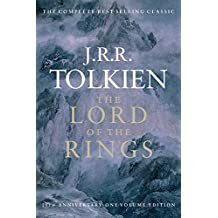 Inexplicably, the all-in-one Kindle version of Lord of the Rings is currently priced at $2.99. I knew it was on sale a while back, and nabbed it for myself then, thinking the price would go back up very quickly. But apparently it’s back down again. I have no idea how long this will last. I really do prefer reading on paper… but LOTR is a lot of paper! It’s much easier to travel with the ebook edition. And when cash is tight, and you love books — well, it’s a solution for the literature-greedy people like me. No, you can’t buy this, yet! 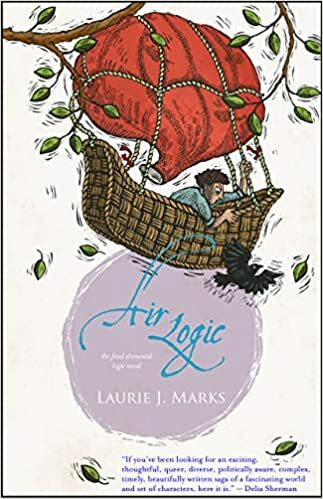 But Laurie J. Marks’ Air Logic has a cover and a publication date! It’ll hit the stands, bookstores and online sites in July. I can’t say enough good things about Tor.com. They’re an outstanding source of information about new books, new SF/F ideas, reviews of books and films and TV, current and vintage. And general SF/F news. And interviews with authors. And thoughtful essays… If any of these things are of any interest to you, Tor.com really is the place to go. This entry was posted on Saturday, December 15th, 2018 at 3:01 am. You can follow any responses to this entry through the RSS 2.0 feed. Both comments and pings are currently closed. Thanks for the recs! I especially look forward to Air Logic. 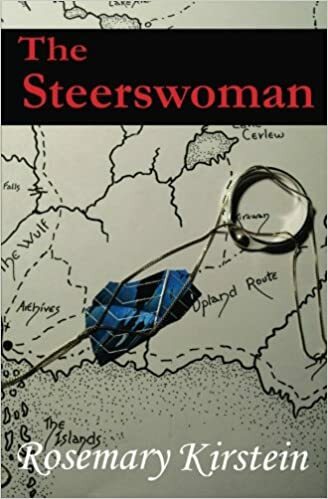 Is there still a plan for a paperback version of Steerswoman book 1 that is the same size as the other books? Yes, I’m still planning to replace the current version of the first book with one that matches the size of the others. However, my plans for that have been a bit delayed. Off in the background, CreateSpace, the service I used to create the paperbacks, has been merged into Amazon Kindle Paperback. Amazon has owned CreateSpace for a while now, but kept it as a separately operating entity. Now that they’re together, I moved all my paperbacks over to Kindle Direct Publishing. And now I have to learn a whole new system for creating the paperbacks! I’d like to do it without deleting the current version until the last minute. It might in the end turn out to be ridiculously simple, but I’m not at the moment able to devote a lot of time to finding out. So, sorry but it surely can’t by done by, say, Christmas! Unfortunately, there’s no LOTR kindle deal on amazon.de, which would have been really nice. Re: DRM — some Big Name Publishers have chosen to do without DRM. Tor Books, for example. And, heck, they won’t let you buy Kindle files from Amazon.com instead of Amazon.de? The rats! I don’t think I could ever do a full month, but I noticed that even during power outages of just a few hours, I would often have some of my best ideas or do my best work. So I have experimenting with pulling the plug for certain hours in the day instead. This seems to be pretty helpful! I’m not sure whether it’s better to do it on the spur of the moment or on a regular schedule yet.